Made of durable stainless steel and plastic, these fish grippers are built to last through every catch. The Fish Grip’s jaw-shaped design locks in for a firm hold, while minimizing the risk of injury to both the fish and the angler. Meanwhile, their many color options offer something for everybody – and keep your grip safely in sight.The Fish Grip was developed by avid anglers, so they know what it takes to hold down a catch. It took 16 years and four different fish gripper models to create a truly unique grip that will ensure the safety of you and the fish you hooked. After all, it’s the only grip with a heart. Keeping hold of the day’s big catch just got a whole lot easier. 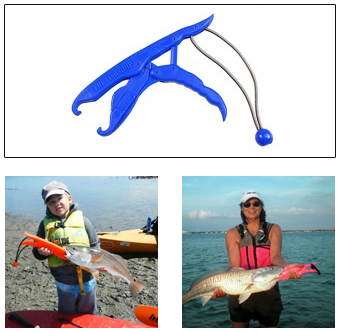 Interested in carrying Fish Grip products? Contact us.